Led Zeppelin are being honored in Denmark next month on the 45th anniversary of their first live show. The September 7, 1968 event is being celebrated with a special plaque in a primary school in Gladsaxe. There were usually three bands in one night. The scheduled headliner that evening was to be The Yardbirds, but they broke up that summer. 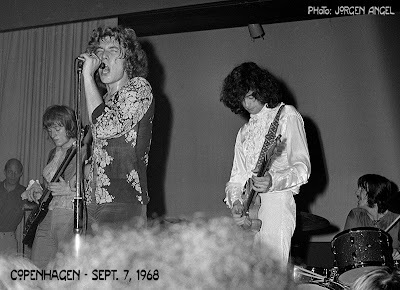 Guitarist Jimmy Page, however, had formed a band with new players that would appear at the Gladsaxe Teen Club under the name "The New Yardbirds." The three new members of the group were singer Robert Plant, bassist John Paul Jones and drummer John Bonham. They had only practiced a few times together in London, then in the afternoon of September 7th, they knocked on the door at the school in Gladsaxe and asked if they could practice a little before the evening's concert. And so, a school in Gladsaxe would host the world premiere of one of the world's greatest rock bands, Led Zeppelin. On September 7, 2013, a plaque commemorating the historic event will be unveiled at Gladsaxe School, which Egegaard School was called in 1968.